Construction and building apprentices would be hard-pressed to find more relevant industry training in central Australia. 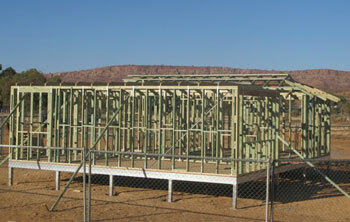 Second and third year students are building a transportable home on-site site at Charles Darwin University’s Alice Springs campus as part of their apprenticeships. The project goes beyond demonstrating their second and third year competencies as part of their Certificate III in General Construction by giving them satisfaction of a completed product. The students cover planning and certification of the building as though they were on-site. The transportable will comfortably house two to four people with two bedrooms, a kitchen and lounge area. 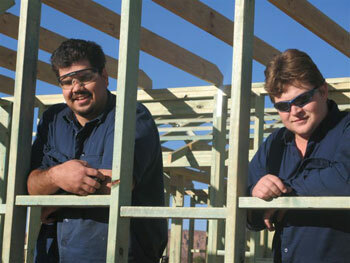 Team leader for Trades in central Australia, Justin Busse said the students preferred to work on “live” projects which had an outcome. “This way they can see their progress and understand the many pressures and people involved in efficient building practices,” he said. Costs will be recouped largely with the planned auction of the house at the end of the year. “With existing transportable houses trucked at great expense from interstate, we are confident of strong interest in our project at CDU,” Justin said.